These carrots appear as part of my mid-winter festive meal. They’ve a heartening color for when the sun isn’t shining (not necessarily a problem in southern California), and provide a slightly sharp counterpoint to the richness of much of the rest of the meal. They also benefit from not being a fuss to prepare when there’s a lot going on just before dishing up a formal meal. They’ll sit quite happily, covered, in the pan for a while until you’re ready to serve. Slightly sweet, slightly tart. We like ours cooked through, but if you like yours a bit crunchy, just reduce the water in the pan and the initial steaming time a little. Put the carrots in a large frying pan with 1/4” or less of water, the rosemary, orange juice, brown sugar, and lemon juice. Bring to a gentle boil, and simmer until the carrots are almost cooked. If necessary, boil hard until the liquid has all evaporated, then add the margarine and briefly sear the carrots, stirring frequently. Variation: Use a small (12 oz) bottle of hard cider instead of the orange & lemon juice & water, and add a tsp of mild mustard; there is no need for the step involving the margarine as the cider makes a scant syrupy sauce N.B. You can also skip the brown sugar if the cider is sweet. I know, I know, I should have got this recipe out before Thanksgiving, but it’ll have to do that I’m getting it sorted before Christmas as I’m including it in my planner as an alternative to the rich Christmas Pudding for those who need an alternative. I do find apple pie to be a homey type comfort. I have a particular liking for this one with its two different layers of apple: one a warm chunky sauce, the other slightly crunchy, glazed apple slices, all nestling in a hearty almond crust. This got a thumbs up from my family when I cooked it last night. My husband particularly liked the contrasting slight crunch of the apple slice layer. If you use a straight sided tin rather than a pie tin, you’ll need to use the greater amount of apple sauce. It’s also up to you whether you peel your apples before slicing and using to decorate the pie. I’ve done it both ways. 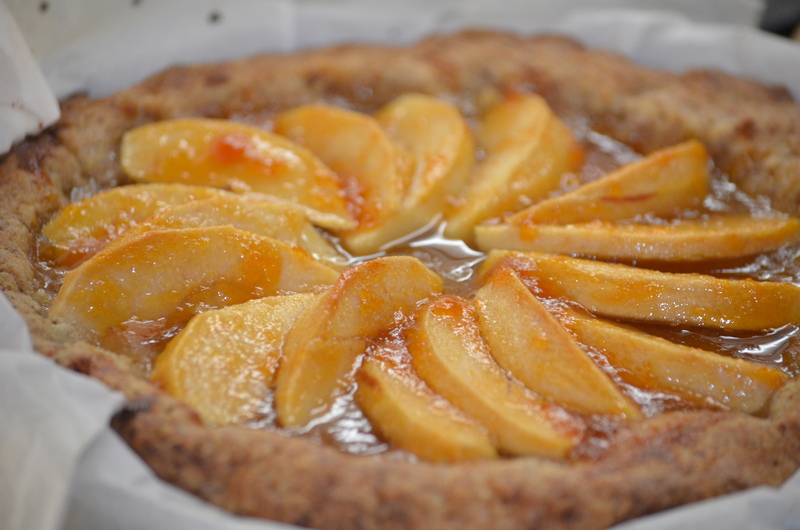 Apricot glazed apple pie with almond crust. Line the bottom of an 8″ pie tin with parchment paper; grease the tin thoroughly (not needed if you entirely line the tin with parchment); crumble the pastry into the pie pan, and compact into place with your knuckles. Make sure to press your knuckles into the corners so the pastry doesn’t get too thick there. Pour the apple sauce into the crust, and smooth over with the back of a spoon. Cut the apple into quarters through the core, then cut out the core, and slice each quarter into 5 or 6 long slices. Arrange the apple slices in a circle on top of the apple sauce. If using honey, drizzle it over the apples. If using apricot jam, heat it, then pass through a sieve and brush onto the apple slices with a pastry brush to glaze them. Preheat the oven to 370F and cook for 40 minutes on the middle shelf, lightly covered with foil after 30 minutes, if the crust starts to look too brown. Remove from the oven and allow to cool for a few minutes before removing from the tin. Serve with cashew pouring cream. This pie was lightly glazed with honey, and baked in a vegan almond crust. The honey doesn’t give as good a glaze as the apricot jam, and isn’t vegan. It does introduce an intriguing flavor hint to the apple, though. 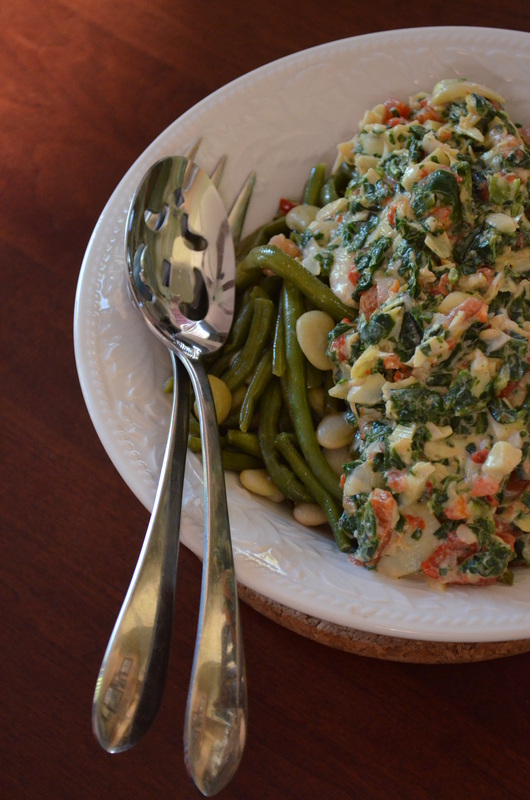 This dish started off life as my veganized version of a rich artichoke and spinach dip. Then one day, I had some left over from the day before, and needed a sauce for some beans, and this rather delightful combination was born. If you just want the dip as itself, just make this recipe up until the part where it says to deal with the beans. If you’re making a dip instead of a sauce, you can use a fresh red bell pepper rather than roasted. Make sure that you like the taste of the roasted red bell peppers before using them, though. I find that some of the jarred ones have way too much citric acid in them! Have a mouthful of pepper before adding to the dish, and if you don’t think ‘yum’, use a different kind. Chop the artichokes and red pepper until they are in pieces no bigger than a large pea, either by hand or by pulsing in a food processor. Put the spinach in a small saucepan, and heat on high, stirring occasionally, until fully defrosted and the liquid has evaporated. Stir together the cream cheez or mayonnaise, nutritional yeast, and miso; then stir everything (except for the two types of beans) together, until the ingredients are amalgamated, but not pureed. At this point you can put the sauce aside until you’re ready to cook and serve, or chill and serve as a dip. Steam the green beans with 1 tsp salt (or to taste) until soft (or to your liking). Serve at formal meals, or in baked potatoes for a more casual lunch. 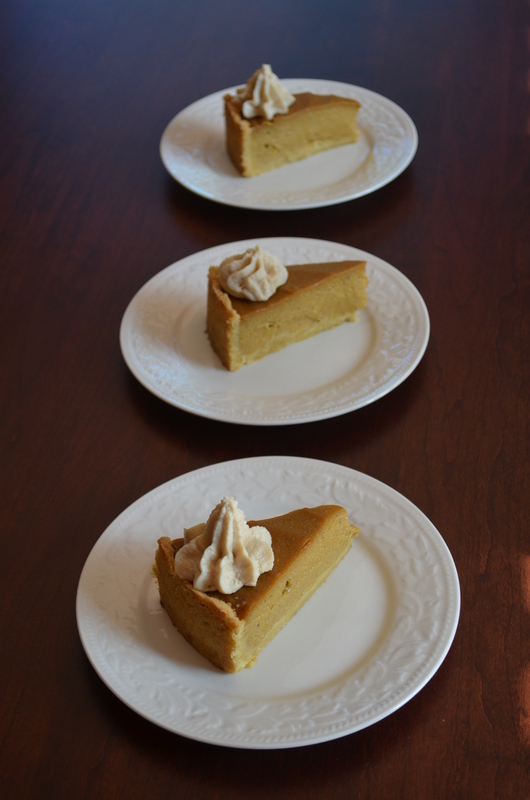 I made 4 tofu pumpkin pies over the last week or so before settling on this recipe. Daughter #1 is starting to protest (Update: but she did eat it, and proclaimed it good), since each pie serves 8 people (and my husband won’t eat pumpkin). Daughter #2 is still enthusiastic, and I have to say, I really like this final version (which I made with vegan crust). The initial version used maple syrup and molasses instead of sugar, but the pie came out darker than I liked, so I resorted to sugar. Make sure to chill the pie before cutting it, as the filling needs to set. The cashew cream will pipe just fine if you gently cook it until it’s thick, and then chill it. If you’re making this for Thanksgiving, then having it in the fridge the day before is not actually a hardship. 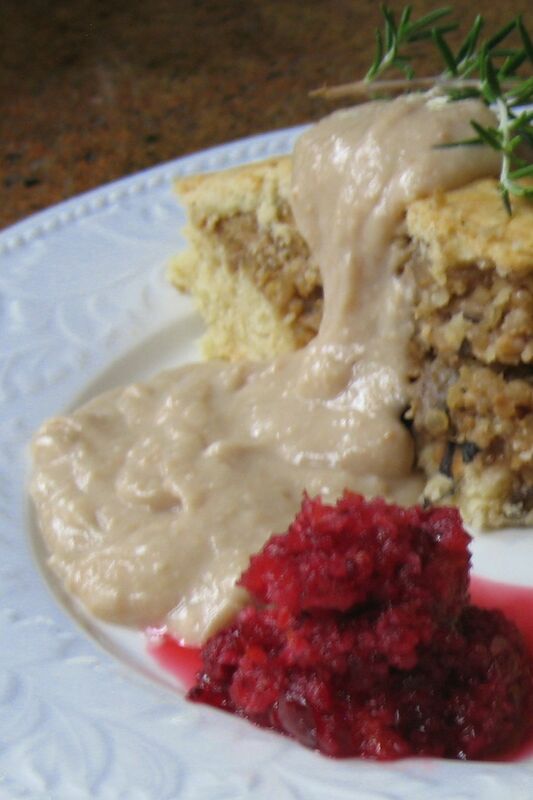 Note that if you use a vegan crust (by using flax eggs), then the whole dish is vegan. Make the pastry, and roll out between two sheets of parchment paper until 1/4″ thick. Remove the top sheet of parchment, and use the bottom sheet to transport the pastry to an 8″ diameter x 2″ high cake tin, then press into place. If using raw cashews rather than cashew flour, process them to a coarse flour in a food processor. Add the remaining filling ingredients to the food processor, and process until smooth and creamy. Pour the filling into the pie crust and bake in the center of the oven for 1 hour. Chill and serve with Cashew Cream. 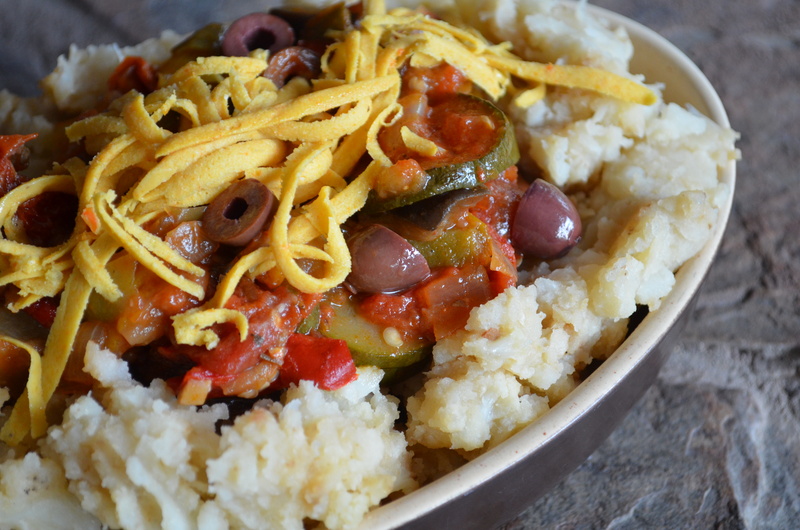 Ratatouille is a traditional, rural French stew. The ‘right’ way to make it depends on whose kitchen you’re in. I find it odd that I tend to regard it as a rather austere dish, and yet when I make it, I revel in the flavors. I think part of that can be attributed to the addition of sun-dried tomatoes and olives that enrich it. 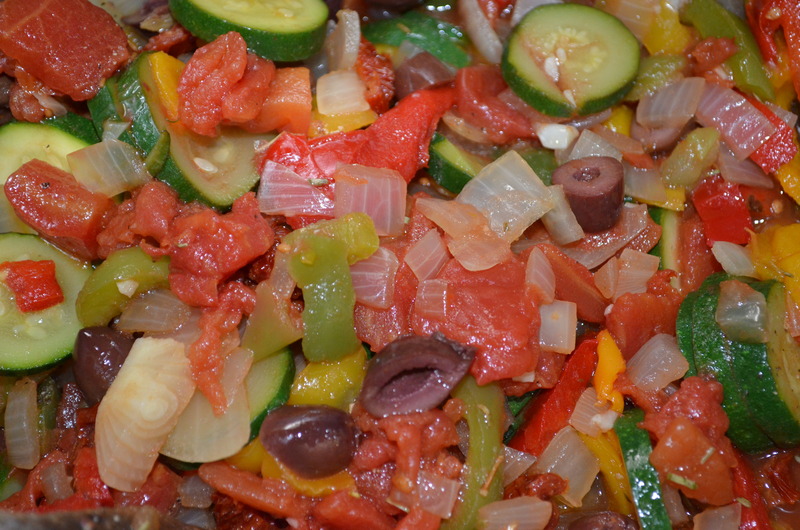 Here in my kitchen, the quantities of the various vegetables in ratatouille are approximate since this is a very forgiving dish and can be varied depending on the cook’s mood or the availability of produce. The finished dish can be frozen since the vegetables are all cooked until they are on the verge of terminally relaxing together anyway, though it is better fresh. If you’re not familiar with eggplants (aubergines), know that you want to pick one that feels heavy for its size, and is shiny. As they mature, eggplant seeds get darker and harder, and holes start to appear in the flesh, which also gets pithier. Mature seeds are rather unpleasant to eat. Another feature of eggplants, is that they absorb oil like the proverbial sponge. To get around that problem, you can either avoid frying them (and cook them in the tomato liquid – the easy option, and my preferred method), or you can salt them for 1/2 hour before cooking. I believe the traditional method of making ratatouille, is to fry everything individually before combining. Personally, I couldn’t stomach the fat involved, and am happy to accept the mixing of flavors that must happen when the ingredients are cooked together. These quantities make about 6 servings. I like to serve it up in baked potatoes (coleslaw on the side), with garlic mashed potatoes, with garlic bread, in a gourgere, or with GF pasta (and grated cheez). 2-4 red/yellow/orange bell peppers chopped into 1/2″ thick strips (frozen works well). Initially, the tomato doesn’t appear to be quite enough for the stew, but the dish becomes moister, as the vegetables soften. Heat the oil over a medium high heat in a large saucepan. Add the onion, sauté for 2-4 minutes. Add the zucchini (courgette) and peppers, sauté for 2-4 minutes. Add all the remaining ingredients, except for fresh basil (if using). Stir, cover, turn the temperature down for a gentle simmer, stirring occasionally until the vegetables have released their juices: about 15-20 minutes. Add the basil, if using, and season to taste. Remove the lid and cook until excess juices have evaporated and the ratatouille is a thick stew (or however you like it).